As with almost any big release, Gran Turismo 6 will debut alongside a swath of bonus pre-order content. We've got the details. Gran Turismo 6, the latest entry in Sony's long-running, fan-favorite racing simulation franchise, debuts on the PlayStation 3 later this year. We don't know exactly when just yet, but Sony has been kind enough to detail the game's various pre-order options. As you'd expect, they mostly consist of extra cars that none of us will ever have the opportunity to drive here in meatspace reality. 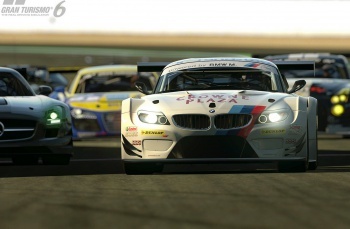 Before we get into what Amazon and Gamestop are offering prospective buyers, it should be noted that everyone who pre-orders the racer, regardless of how they do so, will receive four bonus cars for use in Gran Turismo 6: The 2011 BMW Z4 GT3, the 2013 Nissan GT-R NISMO GT3, the 2013 Tesla Model S Signature Performance, and the 2014 Chevrolet Corvette Stingray C7. Like I said, expensive rides. In addition to those vehicles, Amazon is offering those who pre-order a cool one million in-game credits to outfit their virtual garages in any way they might see fit. While free cash is always welcome, it's not terribly difficult to earn credits in Gran Turismo, so this seems like more a headstart on the game itself than an actual content bonus. By contrast, Gamestop is offering a special "15th Anniversary Edition" steelbook release of Gran Turismo 6 which includes "customized paint chips, race suit, helmet, PSN Avatar, and a copy of Beyond the Apex II app," as well as 16 additional cars, all of which are said to feature unique upgrades that can't be found anywhere else - at least not until Gamestop's exclusivity agreement runs out. An Audi R8 and an Aventador? I'm sold. If any of you would like to rail against this list of cars (or the concept of pre-ordering in general), the comments are below. Otherwise hang tight, and we'll bring you news on when Gran Turismo 6 might hit shelves just as soon as Sony is ready to reveal that info to the world.